With proper attention and houseplant care, your tropical plants will thrive and flourish. Providing the ideal lighting, water, and temperature requirements for your houseplants will ensure they maintain their exotic appearance in your home. 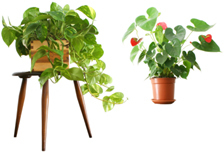 Houseplant care starts with selecting the right plants for your home. It’s easier to buy plants that will thrive in the existing environment of your home, instead of altering the environment of you home to accommodate the plants you buy. Plants should look sturdy, clean, and healthy. Unhealthy signs include yellow leaves, wilted foliage, and spindly growth. Thoroughly check plants for signs of insects and disease. Plant requirements should match conditions in your home. Your lifestyle should allow you to care properly for the plants you select. If plants require a lot of watering, you, or someone you trust will need to check plants often. Shade plants from direct sunlight. Be sure the temperature within the vehicle is not too hot or cold. In extremely cold temperatures, protect plants by wrapping them in newspaper and place them near a heater. If temperatures drop below 50 degrees Fahrenheit, plants can be damaged beyond repair. Light provides the energy source plants need to manufacture food (photosynthesis). It is essential for healthy, thriving plants. 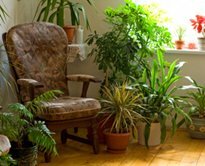 The lighting requirements for houseplants typically fall into three categories: low, medium, and high. Low Light Plants – Philodendrons, Ferns, and Ivy. Medium Light Plants – Spider Plants, Dracaenas, and Palms. High Light Plants – Hibiscus, Poinsettia, Kalanchoes. Lighting requirements for tropical houseplants vary by species. Use lighting requirements as your guideline for the selection and placement of your plants. 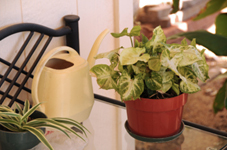 Watering houseplants properly, a basic element of houseplant care, keeps them healthy and vibrant. Both over-watering and under-watering can lead to poor plant health, decline, and possibly death. Pots should have adequate drainage (usually a hole in the bottom of the pot). Check moisture by sticking your finger into the soil up to the first joint. If the soil is almost dry at your fingertip, it’s time to water the plant. Water the plant until water runs out the bottom of the pot. This will flush out excess salt build-up as well as ensure the bottom of the pot receives sufficient water. Do not let the pot sit in standing water, this can cause root damage. Remember, the amount and frequency of watering depends on many factors, such as species, size, location, and soil mix. Check your plants regularly. Temperature – In general, tropical foliage houseplants thrive best in temperatures between 70-80 degrees Fahrenheit during the day, and 60-69 degrees Fahrenheit at night. Tropical flowering plants will grow in the same daytime temperature range; however ideal nighttime temperature is 55-60 degrees Fahrenheit. Spraying plants with a fine mist of water. Placing pots on trays filled with pebbles and a thin layer of water. Soil – An ideal soil mix ensures good water drainage and root aeration. If you decide to use commercial potting soil, be prepared to add sand or perlite to ensure proper drainage and plant growth. Repotting – Spring is the time of new growth and an ideal time for repotting your plants. Increase container size gradually (1-2” in diameter is usually sufficient). Fast-growing plants may need to be repotted more often. Fertilization – Most houseplants can be fertilized every 3 to 6 months. You can water your plants with a diluted fertilizer solution, or administer a time-release fertilizer.